The Wonder Walker will show your toddler a whole new world! 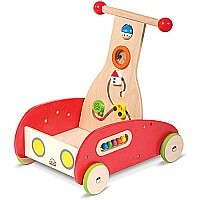 Easy-glide design includes mind-growing on-board activities: counting, colors, gears and more! Lovingly made by Hape with environmentally safe materials. 18" x 13" x 19". It?s the perfect go- and-grow toy! For ages 1-3 yrs.